Galaxy S I9003 users can now upgrade their devices to the latest firmware which ropes in the goodness of Gingerbread 2.3.6 firmware dubbed as XXLE4. This firmware fixes all the bugs related to camera and Google PLAY Store and earlier some of the apps were facing forced close error. Readers need to be aware that this firmware is officially launched in Russia but it can be used in all devices around the globe since it’s a universal firmware and not a country specific firmware. The best part of this firmware is that the firmware has minimum bugs. Important: We and even the developer won’t be responsible for any damage that takes place to your device while following these steps. The tutorial we would see today is compatible only with Samsung Galaxy SL I9003. So, make sure you try this tutorial only on this device, not any other device by any company. You must take back-up of all the internal data present in your phone like Logs, Contacts, messages, etc. with the help of backup applications. Battery should be charged enough in order to apply this update. 60% minimum is recommended from our side otherwise your phone may get switched off while the update process. Disable all antivirus suites in your computer as well as mobile so that update process may not get interrupted. Now just make sure you follow the corresponding instructions properly. Grab the Latest XXLE4 2.3.6 Gingerbread Firmware Package from here to your Computer. And extract it. Next, download Odin and after that open it in your computer. Now you need to enter your device into download mode which can be entered by pressing and holding Volume Down key + OK key + Power button till the time you see a green robot on your phone confirming that you entered into download mode. Make sure you have Opened Odin in your computer. Now connect your phone to computer while ensuring Odin is open in your computer. As soon as you connect your phone to the computer, the ID: COM section in Odin will turn Yellow. Click on “PDA” tab to select “I9003XXLE4_I9003XXLE4_I9003SERLE4_HOME.tar.md5” file and then finally click on ‘Start’ button present in Odin to start the process of firmware update. The process would take few minutes to complete. After it is done, the phone will reboot on its own and after you see the home screen on your device, disconnect your phone by removing the USB cable. Turn off your phone and enter device into recovery by pressing and holding Volume Down key + OK Key + Power button. In recovery mode, select the option of ‘wipe data/factory reset’ and ‘wipe cache partition’ so that you can clear the cache. Finally, reboot your phone by selecting the option ‘reboot system now’. And you have successfully updated your device. 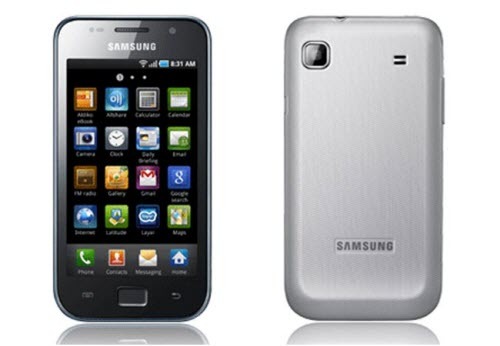 Congo, you have now successfully updated your Galaxy SL I9003 Android phone with Official XXLE4 Gingerbread 2.3.6 Firmware. Grazie per la guida! Aggiornamento riuscito senza problemi. Mi sembrava strano che potesse andare senza file .PIT phone e csc, però è andato tutto bene! No lo he probado todavía. Vamos a probarlo y le permitirá saber nuestra opinión. Sin embargo, si desea instalarlo, se puede proceder a su propio riesgo. Hola, se publicará una actualización para su problema en breve.